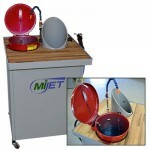 MiJET® Deluxe Wash Station for 12" dia. MiJET - with Solvent Container & Parts Basket. Inclu..
MiJET Deluxe Wash Station for 8" dia. MiJET - with Solvent Container & Parts Basket. Includes ta..